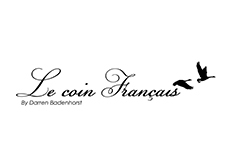 Sweet is the ocean breeze, sweeping the magnificent Hottentots-Holland Mountains, gently touching indigenous fynbos and iconic South African vineyards on her journey to us at Stellenbosch. Privileged are we to harvest the soft humidity from nature’s embrace. 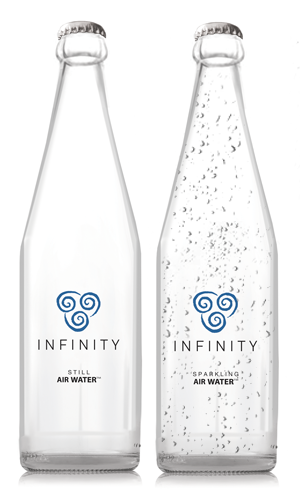 Our artisans fill each bottle mindfully to bring you the unique experience of the Infinity Air Water lifestyle. 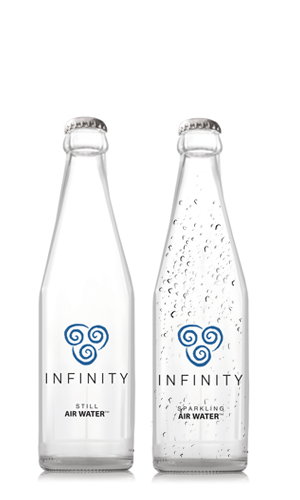 Infinity Air Water is a bottled water supplier in the Western Cape, South Africa. 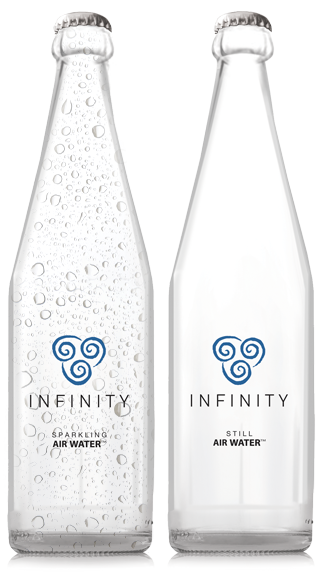 Infinity Air Water comes from the pure and vast Stellenbosch Air. 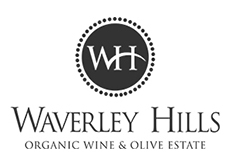 The journey begins with the natural formation of humidity over the ocean before being carried to Stellenbosch by the consistent breeze of Cape Town’s Mediterranean climate. 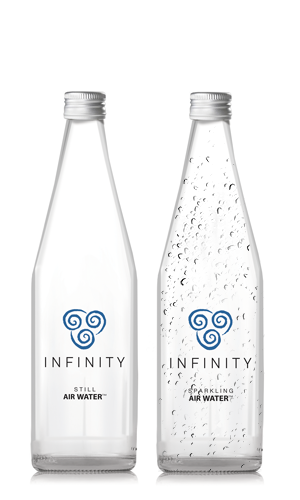 Our water never touches the ground, resulting in the pure, smooth taste of Infinity Air Water. Harvesting humidity. 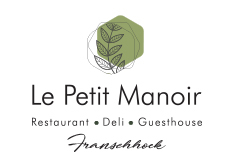 Stellenbosch humidity is in excess of 70% all year round. 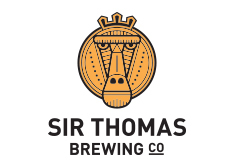 Perfect conditions for our atmospheric water generators to condense the moisture in the air by cooling the air below its dew point and collecting it for our bottling process. From the air to your bottle. The water is filtered and treated with ultra violet before being bottled by our artisans to bring you the perfect balance of purity, smoothness and necessary minerals. 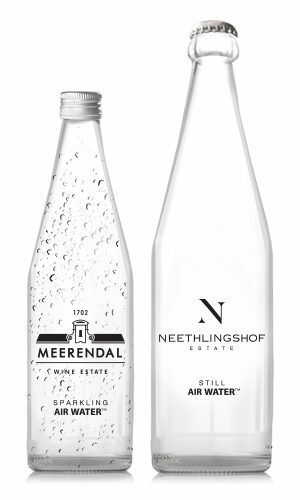 Stellenbosch is famous for its iconic wines, and now brings us a sophisticated drinking water. Every litre of Air Water consumed leaves a litre available in the city’s water system, since we harvest the humidity from the air. We will be adding 1 million litres of drinking water to the local water balance per year. When you choose Infinity, you are supporting the reduction of plastic and single-use glass bottles. By returning glass bottles, you are contributing to the reduction of at least 2 million plastic bottles per year. 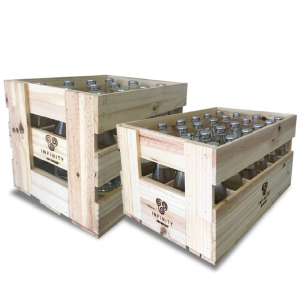 Not only do we use glass bottles which are reusable and 100% recyclable but our crates for distribution are made of wood, a reusable, repairable and renewable material. INFINITE. 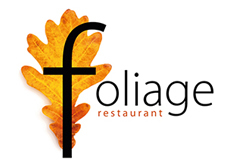 We believe we live in a world of abundance. The availability of clean drinking water is getting seemingly scarcer worldwide. Yet we only need to consciously turn our gaze to the vast and infinite sky to witness the untapped potential of the humidity all around us. We choose to be part of the solution by using innovative technology to bring clean drinking water to the world, effectively from thin air. PURE. 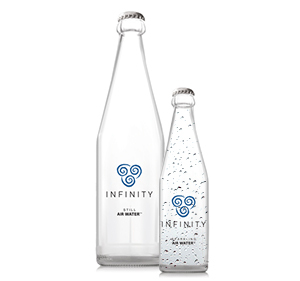 Infinity Air Water is harvested from the air and never makes contact with the ground keeping it free from elements that may alter its taste, resulting in a water of supreme purity. SOFT. The Total Dissolved Solids (TDS) contained in our water are low (below 20 mg/l), which means only the required minerals are present so you can enjoy a smooth, light and fresh taste. AUTHENTIC. 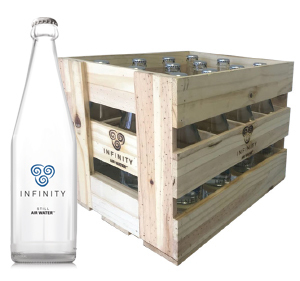 Infinity Air Water is a local, boutique water bottlery based in Stellenbosch. Each harvested drop of humidity is bottled mindfully by our artisans to bring you the unique experience of drinking water from the air. BALANCE. Alkaline water is a powerful anti-oxidant. It boosts the immune system and balances the pH in your body. Infinity Air Water has a pH of 8 and is therefore alkaline. TRUST. Multiple safeguards used in the bottled water industry are taken to ensure the quality of our water, including 9 stage filtration and the use of UV light before being bottled.